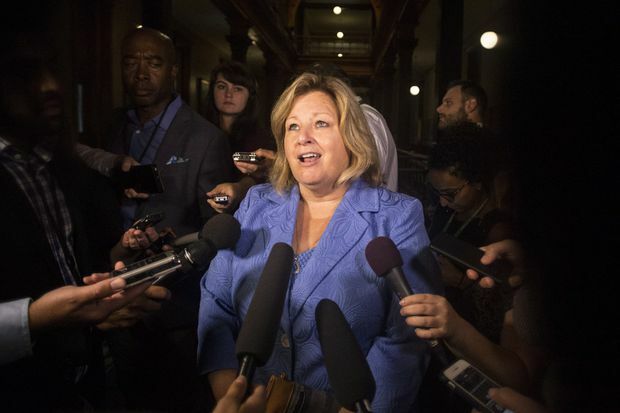 Education Minister Lisa Thompson scrums with reporters following Question Period, at the Queens Park Legislature, in Toronto on Aug. 9, 2018. Math has become a flashpoint in many parts of the country as falling test scores have ignited debate about how the subject is being taught in schools. The discussion has been particularly intense in Ontario, where Premier Doug Ford has vowed to introduce a back-to-basics reshaping of the math curriculum. Now more fuel has been added to the Progressive Conservative government’s agenda after the percentage of Ontario elementary pupils meeting provincial standards in math dipped to a record low. “This is unacceptable,” Education Minister Lisa Thompson said in a statement following the release of tests results from Ontario’s Education Quality and Accountability Office. They showed that fewer than half of the province’s Grade 6 pupils – 49 per cent – met the provincial standard in math in the 2017-18 academic year, a one-percentage-point decline from the previous year and a five-percentage-point drop since 2014. In an e-mail on Tuesday to school board chairs, a copy of which was obtained by The Globe and Mail, Ms. Thompson asked districts to refocus one of their three mandatory professional activity day for teachers on arithmetic skills, and that they do so before the December holidays. Since its election in June, Mr. Ford’s government has moved swiftly in announcing a sweeping education review that would solicit input in a number of areas, including changes to the mathematics curriculum. On Wednesday, Ms. Thompson blamed the previous Liberal government for a “failed experimental curriculum called ‘discovery math,’” which emphasizes group problem-solving and expressing ideas in a variety of ways as opposed to using traditional formulas and memorization techniques. She has promised to “restore proven methods of teaching the fundamentals” and examine teacher training in university education programs. A spokeswoman for Ms. Thompson said she was unavailable for an interview on Wednesday. Earlier this week, the government released a teacher’s guide and a parent fact sheet on the Ministry of Education’s website that reflected the current curriculum, but was specific on key math concepts for pupils in the elementary-school years. Cathy Abraham, president of the Ontario Public School Boards' Association, said while the content of professional activity days have already been accounted for, districts will find a way to incorporate the government’s request. Many teachers have said the curriculum, which emphasizes problem solving, keeps students engaged in the subject. They also say that standardized tests are not reflective of the way children learn in the classroom. But some parents and math educators have called on ministries of education to improve teacher training and return to an approach that emphasizes practice and memorization in the early years over creative strategies to solve problems. In Alberta, the provincial government is overhauling its curriculum that would, among other things, have children memorize more of the multiplication tables earlier, be introduced to fractions starting in Grade 1 as opposed to Grade 3, and have financial literacy explicitly addressing counting money. “Our government has heard parents’ and students’ concerns about math, and we know that strong math skills are key to successful learning,” Education Minister David Eggen said in an e-mail statement. Alberta’s United Conservative Party Leader Jason Kenney commended Mr. Eggen for taking some steps away from discovery math. “Our primary concern is that a revised curriculum not pursue failed pedagogical fads like so-called discovery learning, and that it be politically neutral," he said in an interview on Wednesday. Manitoba’s new Education Minister Kelvin Goertzen has also indicated his province will look more closely at math curriculum and teacher training, according to a news report. In Ontario, Clive Packer, an Ottawa-area parent who has been outspoken about the failure to change the direction of math education, argued that the curriculum does not allow pupils to master the basics in the early grades before moving on to more complex topics. He said he was unclear what the Ford government was proposing, but was cautiously optimistic because, unlike the Liberals, it was listening to the voices of parents. If changes aren’t made to the curriculum, “I think the decline will continue and we are in danger of ending up with a non-numerical society," he said. Cory Judson, a Grades 6 and 7 teacher in the Brantford, Ont., said he is concerned that the math debate has become so polarized that the government may fail in strike the right balance. He said teachers should be allowed to use their professional judgment in determining what each pupil needs. Ontario’s previous government had targeted declining math scores with a “renewed math strategy,” launched in the fall of 2016 and included mandating elementary-school students receive at least 60 minutes of math instruction daily and as many as three math-specialist teachers to every school. Mr. Ford’s government has replaced that strategy with one titled Focusing on Fundamental Mathematics, and refocused the $55-million in existing math investments to boards to support math coaches in training focused on the fundamentals of math. Much of the focus has been on math. But the EQAO data also showed that the number of students meeting the provincial standard in reading improved over the past five years, and 80 per cent of Grade 6 students meet the provincial standard in writing.